Get full details about this 7 Step Strategic Sourcing training sent to your email immediately after you enter your contact details on the right. The development and implementation of carefully crafted strategies for the acquisition of all goods, equipment, materials, and services has become a critical issue in all organizations wishing to reduce operating cost while improving quality & productivity. 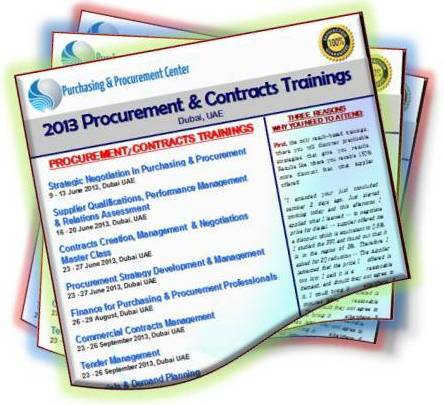 This program explores 7 key areas considered critical to the future success of Procurement Organizations and moves today's supply management activities from its typical tactical focus to the strategic focus needed to successfully implement the processes and methods needed to reach world-class performance now and maintain it in the future. For full details & brochure for this 7 Step Strategic Sourcing , as well as when & where it may be conducted, simply fill in your details on the right.